"The Mint bar and cocktails" located at 3540 E. Grant rd. The show starts at around nine till twelve midnight with no cover charge. I don't know if any one remembers me. I am Dj T Limon. I used to DJ at Casablanca on Wednesday nights. I am going to start a new night at Touchdowns, 6366 E Broadway Blvd. Behind El Charro. It will start May 7th. I will be playing a mix of latin and old school until I figure out what kind of latin music everyone wants. The more salseros, the more salsa, merengue & bachata. The more tejanos, the more cumbias & rancheras and so on and so on. The dance floor isn't to big but if we start having a good nights, that may change. 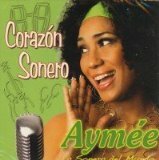 Aymeé soneando in "Esta Noche Tu Night"
For those of you who were not able to go the the 3 band concert at the Rialto Theater to see Sergio Mendoza Y La Orkesta, here's another opportunity to see them live. Y La Orkesta will be the opening show for Ozomatli.